Eastern Wyoming College held the annual GED Ceremony on May 10th, 2012 at the college. The first National Adult Education Honor Society induction also took place during the ceremony. This year’s keynote speaker was Ms. Danielle Maychrzak-Pierce, GED graduate. Dr. Dee Ludwig, Vice-President for Learning pinned the inductees. There were a total of 71 students who earned their GED this year and 21 Honor Society Inductees. Dominique Polk, Peter Schellenberger, Devin Wright. From Ft. Laramie, WY: Danielle Maychrzak-Pierce. From Glenrock, WY: Lanay Shippert, Cassey Wallace. From Hulett, WY: Skeeter Redding. From Moorcroft, WY: Yvette Grewell, Crystal Leeper, Heather Reynolds. From Sundance, WY: Susan Deinhardt, Brianna Martin, Carla Martin, Sandra Stevens. From Upton, WY: Robert Herring. Idolina Rascon, Stazy Rutkowski, Bethany Sanders, Lanay Shippert, JoAnn Sorrick, Beatriz Vasquez. For more information about the GED program at EWC contact Diane McQueen at 307.532.8399 or diane.mcqueen@ewc.wy.edu. Lena Moss from Santee, CA has signed a NJCAA national letter of intent to play for the Eastern Wyoming College Lancers. Moss a 6’2” post player, brings good defense and rebounding to the team. “We are very excited to have Lena join our program. I believe she will help strengthen our interior defense and she has great potential to become a strong offensive player as well,” said Coach Andersen. The Eastern Wyoming College Golf team has a great season and finished in 2nd place in Region IX behind Trinidad State. Zach Waxler, sophomore, Riverton, WY placed 9thin the district which includes Regions 9, 1 and 18. He qualified for the NJCAA National championship that will be held May 15-18 in Newton, KS. Waxler also was First Team All-Region. Mike Yost, sophomore, Torrington, WY placed 8thand Second Team All-Region. Robbie Shipp, freshman, Saratoga, WY was one point behind Mike for 9th place. Michael Martinez, sophomore, Torrington, WY is Academic All-Region and Academic All-American. Also on the team were, Dylan Wisroth, sophomore, Torrington, WY, Wacey Lym, freshman, Evanston, WY, Cayl Carpenter, freshman, Casper, WY and Nate Schelling, freshman, Gillette, WY. “ I am extremely proud of this group of young men. We have some amazing stories of second chances, walk-ons, two-sport athletes, academic accomplishments and athletic improvement on this team. I’m not sure what I’m most impressed with… Zach Waxler winning region IX and qualifying for nationals, Mike Martinez becoming an Academic All-American, Mike Yost joining our team one week into his freshmen year and ending up a second-team all region performer, or Wacey Lym playing and contributing to both the Men’s Golf Team and the Men’s Basketball team. Every student athlete on this team has a great success story or has started a great success story,“ shared Coach Jones. For more information about the golf program at EWC, contact Casey Jones at 307.532.8246 or casey.jones@ewc.wy.edu. 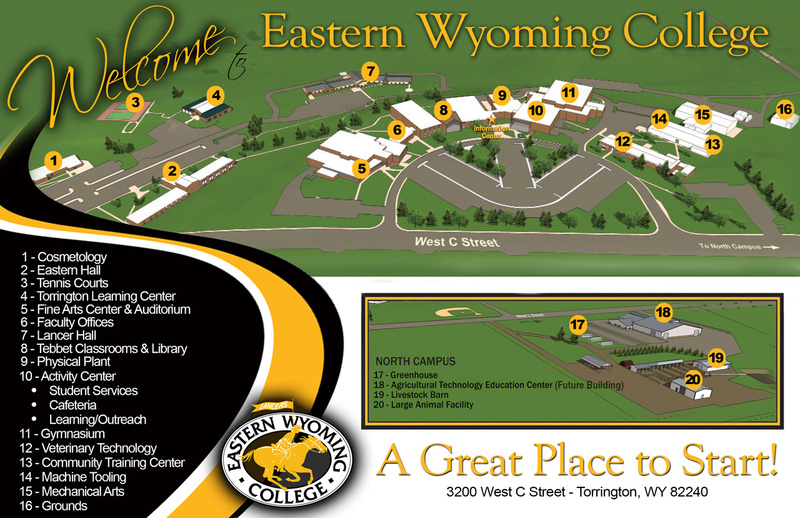 Eastern Wyoming College 63rd Commencement, May 11th, 7pm. Eastern Wyoming College is pleased to announce that the 63rd annual commencement ceremony will be held on Friday, May 11, 2012 at 7:00 pm in the EWC Fine Arts Auditorium. Commencement activities will begin with a barbecue for graduates and their families in the Student Center at 4:30 p.m. on Friday, May 11th. The commencement ceremony will begin at 7:00 p.m. with a processional provided by Janet Howard, Pianist. Ms. Melissa Meeboer, Business Instructor, will serve as the Director of Ceremonies. The National Anthem will be sung by EWC student, Shianna Frye. Dr. Tom Armstrong, president, will then provide a welcome and introduce special guests. Mr. Colby Sturgeon, Student Senate President will provide a welcome on behalf of the students. Dr. Dee Ludwig, Vice President for Learning, will present the candidates for graduation. Following will be the presentation of Diplomas by Carl Rupp, President of the College Board of Trustees. Eastern Wyoming College Foundation President, Patrick Korell will then present the 2012 Distinguished Alumni Award and the 2012 Distinguished Service Award. The closing remarks will be spoken by Meeboer. There will be a ceremony to honor the GED graduates on Thursday, May 10, 2012 at 6:00 pm in Tebbet rooms 131-132. Eastern Wyoming College Community Education will host the Missoula Children’s Choir May 14-19. Auditions will be held on May 14 from 4 pm to 6 pm in the EWC Fine Arts Auditorium. Children, kindergarten through 12th grade are encouraged to audition. The Missoula Children’s Theatre (MCT), the nations largest touring children’s theatre, has been touring extensively for 38 years now from Montana to Japan, and will visit nearly 1,300 communities this year with up to 35 teams of Tour Actor/Directors. A tour team arrives in a given town with a set, lights, costumes, props and make-up, everything it takes to put on a play…except the cast. The team holds an open audition and casts 50-60 local students to perform in the production. The show is rehearsed throughout the week and two public performances are presented on Saturday. All MCT shows are original adaptations of classic children’s stories and fairytales . . . a twist on the classic stories that you know and love. Also included in the residency are three enrichment workshops presented by the Tour Actor/Directors. Creativity, social skills, goal achievement, communication skills and self-esteem are all characteristics that are attained through the participation in this unique, educational project. MCT’s mission is the development of life skills in children through participation in the performing arts.